With rapidly growing interconnected collections of cultural materials, we need new approaches to information organization. We propose that schematic models which describe the content of documents rather than descriptions about the documents are the key for this new generation of descriptive systems. We explore process-oriented models implemented with linguistic frames as an approach to organizing a collection of rich content such as descriptions of history. We show how linguistic frames can implement the state-change model and how those frames might be applied to the organization of content such as history texts and complex materials such as historical newspapers. We focus on verb frames because we base our approach on state changes in entities which are described with verbs. We propose that systems of information organization for rich content such as historical texts be based on a "fabric" of entities and events. For instance, we describe incorporating into the fabric complex entities such as those with multiple parts. We also describe disaggregating complex events with sequences of related events which we call flows, as well as propose a flexible approach to grouping events and a schematic description of people including their mental states. Our approach is a companion to the original content and explicitly allows for versioning, metadata, and hierarchies of entity classes, as well as partonomies, functionality and instances. While our focus here is on history, the structures we define should be able to be applied across a variety of fields and they should be useful as targets for text mining. In a subsequent paper, we extend the fabric to use discourse elements to describe the relationships among events. 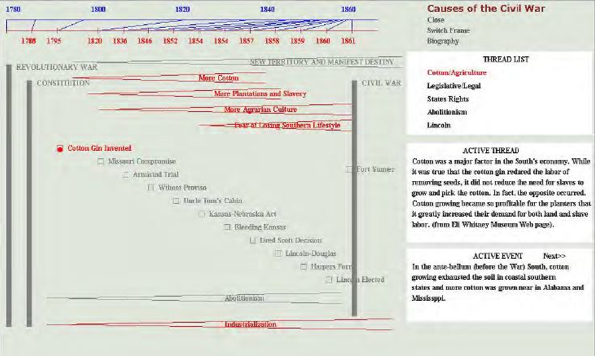 In this paper, we explore how linguistic frames can implement the state-change model and how those frames might be applied to the organization of content such as history texts and complex materials such as historical newspapers. Linguistic frames are structures which bring together the related aspects of a concept. The theory of Frame Semantics  proposes that meaning is constructed by the activation of and interconnection of frames. According to this theory, Frames are typically activated by linguistic units. Thus, the verb "to give" activates the "giving" frame. Several linguistic units may activate the same frame; "to donate" would also activate the "giving" frame. Once the frame has been activated, a person knows to expect to find core frame elements: a donor, a recipient, and a theme (i.e., something being transferred between them). In addition, there may be non-core elements such as the purpose or place of the action. The frame elements are, roughly, semantic roles with the frame unifying them. Semantic roles have been recognized as fundamental to information science (e.g., ). In order to explore the theory of frame semantics, a large collection of frames and associated linguistic units was developed in the FrameNet project . The frames were constructed by examining examples in a variety of texts for elements which were consistently associated with a frame. These accompanying elements were then clustered into semantic roles. Following [3, 8], an event can be viewed as a state change triggered by the state of another entity. In this view, a simple causal relationship is integral to the event. We adopt the term "flow" for a set of events which are related and follow one another (cf. ). They can be modeled with formalisms such as state machines, Petri nets, programs, flow-charts, workflows, and activity diagrams. Similarly, connected threads or scripts of events are familiar from cognitive psychology, and may also be used to model flows. There are different types of flows. They may follow a single prescribed sequence, they may also have branching points, or they may be relatively ad hoc collections of events. Many complex activities combine all of these. For instance, a court trial has a strict overall structure but parameters such as the number of witnesses called may vary and the statements of the witnesses may be unpredictable. High-level descriptions can usually be broken down into lower-level, more detailed components. For instance, a statement that one army conquered another might be broken out into the flow describing how one army landed, attacked, and defeated the other. And, each of those statements could probably be broken down further. We envision a fabric of interconnected entities and events. Initially, the entities and events in the fabric would be drawn from a limited number of sources but eventually they could come from many sources and be interwoven. The events would be interconnected at several levels. For instance, we might say that Hannibal attacked Rome and might also go into detail about those attacks. It is impossible to specify all the events in history and there will therefore be gaps in the fabric, but there is generally coherence in historical texts. To capture that coherence, we extend the fabric with discourse elements in . For instance, the events in Figure 1 are connected by causal threads. In other cases, events are interlinked and interwoven with explanations which provide elaboration and clarification to the event descriptions. Scenarios can be largely independent from other parts of the fabric. We may have a good understanding of the synchronization of events grouped in a scenario but not much about how that set of events relates to the broader fabric. As a stand-alone unit, the events in the scenario could be executed in order with the entities acquiring the successive states. Moreover, some entities are highly transient thus, they may be defined just within the scope of the scenario or situation. People are entities in our framework; they are extremely complex (see Section 3). Our descriptive requirements are far beyond anything offered by current standards such as FOAF. In this section we describe some possible approaches for developing structured descriptions of people. These could have a broad range of possible applications such as providing a formal structure for lifelogs. Similar complex descriptions will also be needed for other very complex entities such as organizations and institutions. Biologically, people can be described as organisms with partonomies and stages of development (see Section 3). For describing typical states and behaviors, we might adopt Maslow's hierarchy of needs (see ). This could describe attributes such as hunger which motivate behaviors and other types of physical states such as diseases. For effective information organization, we might share some structures adopted by the user modeling community. Because individuals engage in a changing set of social relationships, we need flexible mechanisms for defining those relationships. For instance, couples may act as a single composite entity in some situations, but in other situations those individuals may act separately. Eventually, we might also model knowledge, social norms, cultural standards and folk psychologies. Initially, our approach may usefully be deployed on a small scale in ad hoc situations. This approach can be extended to cover large collections of rich content although the sheer scale of that task makes it challenging. One advantage compared to some previous projects is that we are primarily focused on description rather than inference. With inference, small errors can be easily amplified. Complex entities can usually be subdivided into parts. Sometimes these would be physical parts and sometimes they are sub-assemblies each with a specific function. Partonomies are important for all types of complex systems whether they are mechanical systems such as automobiles or social systems such as organizations. The importance of partonomies for describing biological systems is increasingly recognized . They are integral to all types of system analysis. Moreover, partonomies are interrelated with class hierarchies; for example, some parts are shared across trucks, cars, and bicycles while others are not. Hurley, C., 1994, The Australian ('Series') System: An Exposition, in S. McKemmish and M. Piggott (eds. ), The Records Continuum: Ian Maclean and Australian Archives First Fifty Years, Ancora Press, Clayton Victoria, 150-172. Shaw, R., 2010, Events and Periods as Concepts for Organizing Historical Knowledge, PhD Thesis, School of Information, University of California, Berkeley.